Over the years, we have made the effort to preserve the natural beauty of our local shores in Ocean Isle Beach. Erosion by storms, jetties, damming, seawalls, and other means has taken its toll on most beachfront areas in America. Hurricane Hugo, in 1989, devastated the eastern shoreline with its peak as a category 5 storm. Since then, Ocean Isle has rebuilt its beaches, and continues preservation for the sake of wildlife, residential areas, and beach-goers. As a result, Ocean Isle Beach was named 2008's Best Restored Beach by the American Shore and Beach Preservation Association (ASBPA). The areas are judged by the challenges it overcame, such as hurricanes, as well as the ecological benefits and success of the entire program. Ocean Isle Beach has certainly come a long way since 1989. With a residential population of 425, and 25,000 during tourist season, it's easy to claim that the efforts are successful. The nourishment was concentrated at the eastern end of the island, after the town raised $650,000 for the cause. The sand and equipment bought with this money will be used for periodic nourishment. This means that the life of this beach will be extended for the next three to five years, while other funds can be raised for the ongoing nourishment program. As a quiet, family beach with a unique local lifestyle, one can understand why the preservation of our seven-mile shoreline is so important. If you plan on buying or renting a home in Ocean Isle Beach, NC, it's good to know that the community puts so much care into the preservation of its wildlife, environment and living conditions. 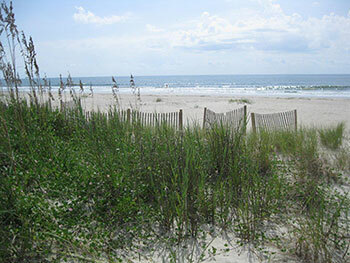 And we're very aware of the beauty of our beaches, here in The Town of Ocean Isle Beach. Fishing, swimming and lazing around the beach are a part of daily routine here. Locally owned water-sports shops offer boat rentals and Jet Ski rentals. The Surf Shops rent out bicycles, surf boards, beach chairs and umbrellas - that is, if you haven't already accumulated a mass of towels, umbrellas, bathing suits and bottles of sun screen. It's hard to live in or visit Ocean Isle Beach, and not take advantage of the nourishment program and all it's done for the local scene! Today, more than 370 beaches across the country have been restored, including Miami Beach, Coney Island and Venice Beach.